At the time of writing this post (around 11AM, Indian Time on 16th September), we have 217 participants in this program. We are eager to help as many more of you as possible before closing the doors. So go ahead and join the program, because, you want to be awesome. When you join, you no longer have to wait to access the material. Everything is available on Day 1. And as you go thru the material, we would be adding some bonus lessons to help you learn better. This applies to VBA, Excel & Dashboard lessons. Once you finish the course, you will be awarded a participation certificate, so that you can show off your VBA proficiency in style. Since quite a few of you are not comfortable (or able) to use PayPal payment option, we have set up 2 pages with alternative payment links. When Exactly are we closing Registrations for VBA Class? We will be closing registrations Today (Sept 16) on Monday (Sept 19) at 11:59 PM, Pacific Time. 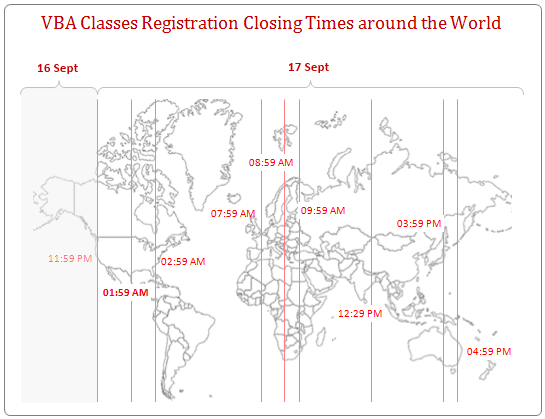 See below map to understand what time the registrations close in your time zone. We also have built an interactive Timer Application (obviously in Excel) to tell you how much time you got. Download it here. PS: More on the Count-down timer application here. We will be re-opening VBA Class in January 2012. But we may delay the launch of 3rd batch if we need to spend more time with 2nd batch students. So go ahead and join us today. All of us at Chandoo.org & VBA Classes thank you so much for your support to this and other training programs. Each time I run a training program, I fear “Whether I will be able to satisfy so many hungry minds“. And every time, you have motivated me, supported me and been patient in learning. Thank you so much. PS: If you are wondering what VBA is & why you need it, take our crash course. PPS: If you want to be wonderful in VBA, take our VBA class.